Oui! 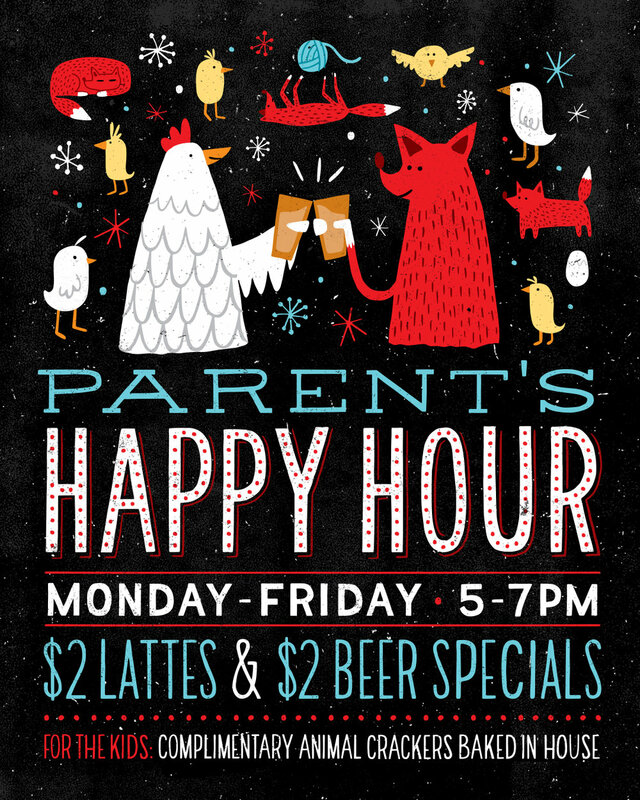 Join us for Parent’s Happy Hour featuring $2 lattes and $2 beer specials PLUS we’ve got our baked in house complimentary animal crackers for the lil’ ones. Stop by our Valentine’s Day Flower Pop Up February 13 & 14! Because grown ups like snack time too! Vegan, tasty, healthy, indulgent – we've got treats of all sorts sure to satisfy your craving. Need a boost? How about a cup of our locally roasted coffee to keep you bright eyed and bushy tailed? Maybe it's time to take a respit - grab a seat indoors or outdoors and enjoy the day. You deserve it! Save the date for a night of family fun! We'll be screening the original How The Grinch Stole Christmas provided by Montage Cinemas plus a fun craft before the show. Popcorn and other refreshments available for purchase to nosh on while you enjoy the movie. Kids (and parents) are encouraged to wear pajamas to get into the spirit! Only $5 a kid to participate in the craft project. Please reserve tickets for the whole family so we can ensure adequate space. Join us as we host a Big Bon Pizza Pop Up. Grab a slice (or two, who's counting?!) and take a breather from all the holiday hustle bustle. Big Bon will be set up in front of Henny Penny Cafe, 1514 Bull St. See you there! Ok, full disclosure, we know you don't need any help keeping warm right now, but that shouldn't stop you from enjoying our hot apple cider! We always get a little excited about cider season so come on down and join in our frolicking. Not feeling cider-ish yet? We've also got a curated craft beer, wine and bubbly menu if that's what you're feeling. We've got you covered. Let's Celebrate Back to School!